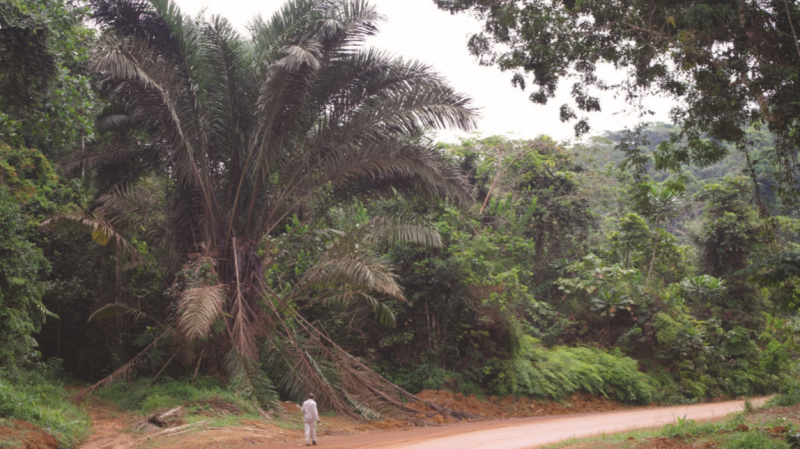 Common sight along road sides in south Cameroon and western Gabon, and growing in hard-to-be-missed dense colonies, it remains a mystery how this locally useful new palm species Raphia zamiana (locally known as “Zam”) has been missed by botanists until now, with its first collection dating to 2012. The overlooked giant has been recently described in the open access journal PhytoKeys, alongside a shy and rare endemic from the same genus. Curiously, it might have been exactly the large size of Raphia zamiana that has discouraged botanists from collecting and cataloguing this species, according to the multinational team of researchers from the University of Yaoundé, Cameroon, National Herbarium of Gabon, Gabon, the Conservatoire et Jardin botaniques – Ville de Genève, Switzerland, the Institut de Recherche pour le Développement, IRD, France. While this theory might sound strange at first, it is plausible, given that a single leaf of this large palm can reach up to 21 meters long and forms dense colonies in swampy areas. Large leaves are not uncommon among the representatives of, what is known as the most diverse genus of African palms, Raphia, with one species, R. regalis, having leaves up to 25 meters, a record in the plant kingdom! Newly described and named to science, this species is, just like many other representatives of the genus, well-known and heavily used across its range. Uses, of what is locally known as “Zam” include: timber, locally referred to as “bamboo”, used for construction, and fruits – for consumption and medicine. Finally, Zam is also used for wine tapping in certain parts. “It is indeed incredible that such a large and useful palm has remained unknown to science until now,” comments author Thomas Couvreur, Institut de Recherche pour le Développement, IRD, France. “This curious fact, however, underlines a bigger problem. While biodiversity is being destroyed at unprecedented rates, we still have a lot to discover and describe, even species that are common, well known and useful. This comes as a surprise to many people and underlines how much remains to be discovered in the tropics. Scientifically describing species, especially useful ones, is very important, as it “puts then on the map”, which allows them to be studied and managed. In this sense, field work remains key.”, concludes Thomas Couvreur. Raphia gabonica in its natural habitat in Alèmbé, Gabon. The need to further study and conserve this group of palms is evidenced by a second newly described species in the same PhytoKeys paper. Named after its country of origin, Raphia gabonica, is restricted to only two small populations from central Gabon, where it occurs on hillsides and along small rivers. Right upon description, R. gabonica is already threatened by extinction. It was assigned a preliminary IUCN status of “Endangered”, because it is found in small unprotected pockets of forest along roadsides. It is now amongst the five most threatened palm species for the whole of Africa. 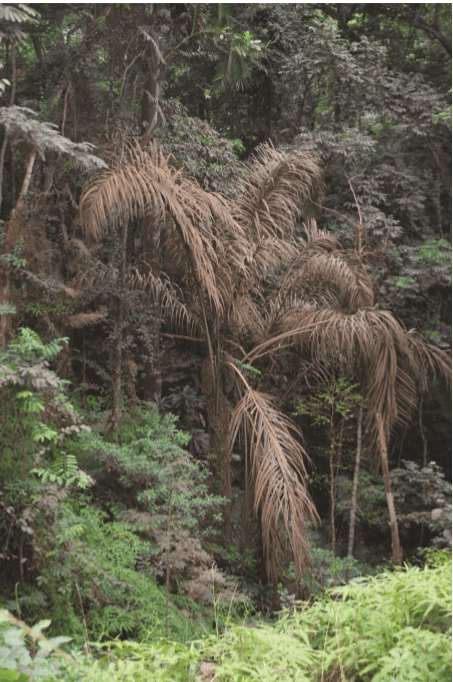 “Our study shows that, despite their economic and cultural importance across tropical Africa and for Africans, we still know too little about Raphia palms. This is very paradoxal and a gap that we need to fill, quickly” adds University of Yaoundé PhD student Suzanne K Mogue. “We hope that our amazing discoveries continue to stimulate further botanical studies and promote conservation efforts across Cameroon, Gabon and central Africa in general,” concludes Professor Bonaventure Sonké of the University of Yaoundé.